I’ve always done things a little backwards, so going back to school in the middle of summer when everybody else is out playing is quite fitting. I started my first class (acrylic painting techniques) on June 22nd, 2008 at the Emily Carr Institute (now reclassified as an official university). 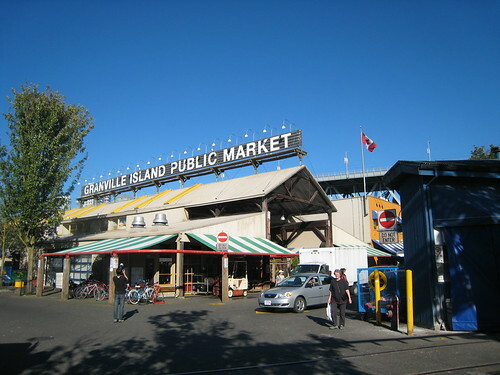 It’s a beautiful space on Granville Island and once again, I feel strongly that I am meant to be here. Ever since I moved to Vancouver, I’ve felt more alive, happier, more ME. It took only a few days before this city felt like home and over a year later, I still catch myself smiling as I gaze at the mountains lit up by the sunset, glowing snow caps behind the skyscrapers and I feel so lucky to live here. It really is an incredibly beautiful city. Going over the materials list for class, I tried to make do with as much stuff as I already had. I had some of my own paints already, some from James (my landlord and good friend) and a bunch of brushes. Masking tape? Check. Bucket for water? Check. Disposable paper palette? I can do you one better; I have a glass palette! Turns out that “disposable” part wasn’t just to save money on the student budget, but was actually important. 15 students all crowding around a sink at the end of class trying to clean their brushes, water dishes AND 15 palettes? Not a good idea. So I picked up a pack of paper palettes by the 2nd class. The paints were another miscalculation on my part. The materials list says, and I quote, “At least 10 tubes basic acrylic paint – suggested colors: lemon yellow, mid yellow cad, azo red light” and so on. I took “suggested” literally and brought an assortment of 10 colors. I made sure I had a couple of yellows, reds and so on, but if I had cadmium yellow light instead of mid, I assumed that would be fine. I even picked up a cheapo Selectrum package of 20 different small tubes of paint. I should’ve been golden! Turns out that “suggested” meant EXACTLY. 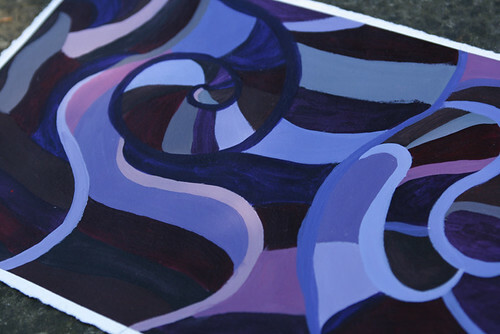 The entire course is based on working from Lisa’s color palette created using those exact colors. I muddled through the first class and at least half the class went down to Opus during the break to buy new paint. Since just buying the class materials was already coming out of our grocery budget this month, I figured I would try to make do with what I had. The first class felt a little intimidating because we just jumped right in. Since I’m mostly self-taught (vaguely remember some stuff from high school, and then a couple of mixed media classes in my 20s), I hoped we would start right from the beginning. Is my brush too dry? Too wet? Should I clean my water more often? Should I sketch an outline first? Am I mixing the paint on the palette correctly? I wanted assurance that the way I had been doing things was not totally wrong and/or really stupid. I was sure that there were going to be some big reveals that would later make me shudder that I had ever _________ (washed my brushes with dish soap, stored them upright, painted the entire background first, whatever!). 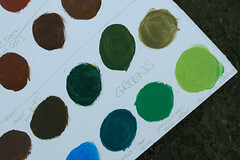 We dove right into color theory working from a specific palette of 7 or 8 paints. The first class was pretty much all focused on the color wheel, warm versus cool colors and how to mix our paints down to get the neutral/diminished shades. When we left class with a homework assignment to make an actual painting, I was worried. What about the basics??? By the third class, I was happy that we’d skipped the basics and dove right in. She’s answered all my questions as the classes have progressed and I’ve already learned so much. Really simple things that I never would have thought of, like keeping a sheet of white paper under my palette so I get a true representation of the colors. Now why didn’t I think of that?! Homework for the first class was to select one color from our color chart and create a painting that used all of its various shades. Simple geometric shapes were fine, but the point was to create a monochromatic painting using, for example, just the 3 blues from our palette, plus the 3 diminished blues, plus all 6 combined with white. I cheated a little by Googling “monochromatic paintings” for ideas. I ended up painting an abstract sort of Candyland with lots of long curving lines laddered so I could fill in each space with a different shade. I sketched the whole thing out beforehand, so after I’d mixed my color palette (purples), I filled in a bunch of random blocks with each color until the whole thing was covered. I found out later that this is the wrong way to go about painting, according to my instructor, as it gives too much of a paint by numbers feel. I definitely agreed with her on that one. For the rest of the class, we’re not allowed to use pencils at all. No sketching! The beauty of acrylics is we can keep building and building. If you make a mistake, paint over it! For planning out shapes, she does allow us to paint in the basic layout, but then she wants us to focus more on building the depth, painting in the lights and the darks, ignoring the details until the very end. Anyway, after I completed the first homework assignment, I knew I had to buy the correct paints. We’re moving at a pretty quick pace and with my ADD addled brain, throwing it another curve by having to translate all of Lisa’s instructions into my own specialized color palette is not a challenge I feel like tackling. The homework project sealed the deal. I mixed so much paint trying to get the right purples out of the wrong paints that I ended up with TONS left over after my monochromatic creation was done. I hate wasting paint, so I made use of it by painting about a dozen blank sheets of paper with it – backgrounds for future paintings. There was still a lot left, so I scooped as much as I could off my makeshift paper palette (I was testing the theory that I could just use wax paper instead of buying what looks like wax paper disposable palettes. You can’t. It tears and balls up and then you end up with bits of wax paper in your painting.) and saved the rest in a Tupperware container. OK, technically it was a cleaned out potato salad container, but you know what I mean. A week later? I learned that paint keeps just fine in sealed containers if you spritz it with water, but it also grows mold. Wouldn’t have guessed that paint could get moldy. Weird. This *may* have something to do with my potato salad container washing techniques. keep a spray bottle of water handy to spritz your palette with. Acrylics dry out fast and this will save you a lot of paint.